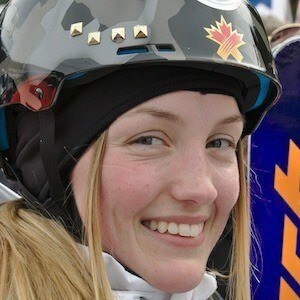 Freestyle skier who became the youngest Olympian to win a gold medal in her sport when she took home the prize at the 2014 Games. A year later, she also won gold in moguls at the World Championships as well as a silver in dual moguls. She first competed in the 2010-2011 FIS Freestyle Skiing World Cup season. She also set an age record there when, at the age of 16, she won an FIS World Cup event in moguls. She earned a silver medal at the 2018 Winter Olympics for Moguls. She grew up in Montreal, Canada. Her two sisters, Maxime and Chloe, are also skiers. The three of them represented Canada at the 2014 Games. She competed against Hannah Kearney at the 2014 Olympics.